Mawarid Technology provides high-performance, efficient, secure and scalable Cloud Solutions with wide range of offerings for Public, Private and Hybrid Cloud. Mawarid Technology offers a wide range of cloud and managed hosting services covering all aspects of data center, server, security and storage infrastructure with 24/7/365 support. Why to spend too much time and money in building your infrastructure requiring hardware, software , humans and hours–if not days–to launch while Software launches automatically and on demand in seconds or minutes and operational expenses are reduced with cloud Hosting with controlling all the implementations remotely, and you pay only for what you use. Your employee’s desktop on the cloud could be great expense of time, resources, and cost. It’s all in one platform where you can use (SharePoint, Email Exchange, and Office Apps) in one interface with integration for active directory to all the products. Web-based applications with cost-effective for foundation stage. Regardless of the size of your organization, Mawarid Technology's managed hosting services enables you to focus on your core business, while we look after managing your hosted assets within our state of the art data center. Can be customized to suite your needs. We continuously provide you with customizable plans to suite your needs, guaranteeing less cash outflow due to reduced recurring fees. Your Infrastructure can be managed with high flexibility. Your server is stored in an accessible and secure location. Easy upgrade available when necessary. 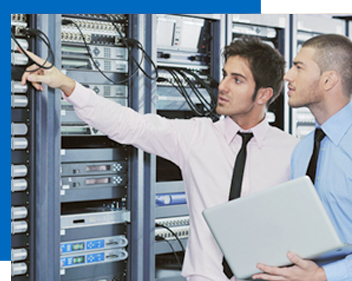 No in-house skills required for server administration, networks, internet, security etc. Focus only on your core business and forget about your server. Stored in areas specifically designed for the purpose. High volume of bandwidth available. Servers are fast and powerful. If your business moves the server can still remain where it is. Mawarid Technology offers VPS that is still fully functional. Control panel is available on all of our VPS plans starting from VPS1 package and is recommended for those looking for an easy- to-use control panel. Less cash outflow due to reduced recurring fees. Clients can focus on the core application. A fully dedicated virtual server (VPS). Mawarid Technology as an Oracle Platinum Partner provide a wide range of service on top of Oracle Cloud and based on different models. Oracle Cloud is the industry’s broadest and most integrated public cloud. It offers best-in-class services across software as a service (SaaS), platform as a service (PaaS), and infrastructure as a service (IaaS), and even lets you put Oracle Cloud in your own data center. Oracle Cloud helps organizations drive innovation and business transformation by increasing business agility, lowering costs, and reducing IT complexity.